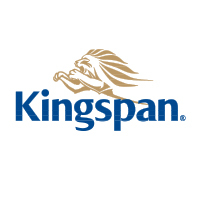 Kingspan Insulation is a leading manufacturer in energy efficiency and moisture management products, offering high performance insulation, building wraps and pre-insulated HVAC ductwork. Kingspan Kooltherm® offers an extensive range of premium performance insulation boards with an R-value of up to 17 on 2 inches for wall, floor, soffit (structural ceiling) and concrete sandwich wall system applications. It has a fiber–free rigid thermoset phenolic insulation core and has excellent fire performance characteristics. The Kingspan GreenGuard® brand portfolio offers extruded polystyrene (XPS) insulation board, building wraps and flashings. Kingspan’s integrated approach has made its products first choice with architects, contractors and developers.